It’s that time of year again, time for holidays and wintry weather. It’s also time to check on your automated sprinkler system. That’s right. It may sound like a thankless chore during a festive time, but you’ll rest easier knowing that your fire-safety obligations have been met. Here are a few tips on getting the job done efficiently. Have employees keep alert for, and report, potential or existing cold weather problems. Check fire-protection systems more frequently than normal during cold weather. Do not attempt do-it-yourself repairs on fire-safety equipment. Rather, obtain the services of trained service personnel. Do not use open flame devices or temporary heating equipment, such as electric heaters, to thaw pipes or other equipment. Do not store excessive quantities of fuel or flammable liquids in areas not designed for that purpose. During the annual servicing of your sprinkler system by your contractor, have them demonstrate the operation of all valves, so you can shut down the system in the event of a burst pipe. Be vigilant with your water supplies and fire pumps to keep them from freezing. Always remove snow from fire hydrants, post indicator valves, and firefighting pump connections. Next, follow a few specific guidelines for the type of automated sprinklers at your facility, which are either wet or dry pipe systems, to prevent freeze-ups. Wet pipe systems maintain water in the piping at all times; dry pipe systems use compressed air in the piping until the system is engaged and water is released. Keep doors, windows, and vents closed when not in use or when resulting drafts would allow cold air to contact sprinkler piping. Remember that high winds may accompany periods of low temperatures. Where sprinkler piping may be exposed to outside temperatures, such as when it is run between buildings, piping should be heated or adequately insulated. Provide adequate heating to maintain the temperature at no less than 40°F near sprinkler piping during a protracted cold spell. Pay particular attention to piping in areas such as attics, stairways, basements, shipping bays, and similar out-of-the-way places where lower temperatures occur. If your sprinkler system must be exposed to freezing temperatures, such as when a building’s or section’s heating system will be shut off, or if heating is interrupted for more than a few hours, take precautionary measures. 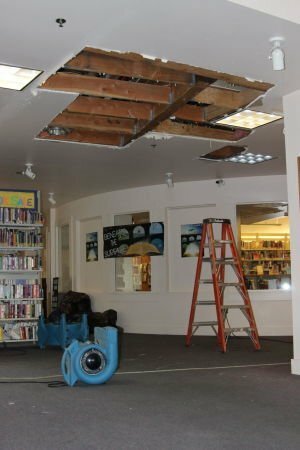 The system’s water may have to be drained and a fire watch established or temporary heating provided. For loading docks or other sections of the system that may have an antifreeze loop system, the specific gravity of the antifreeze solution must be checked prior to cold weather to ensure that it has the proper proportions of antifreeze and water. Make sure the valve is open. Enclose pipes exposed outdoors in a heated weather-tight enclosure. 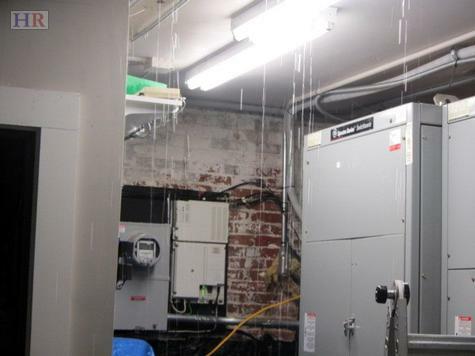 Drain any water or condensate from auxiliary drains and all other low points. Don’t forget the drains under the stairs or platforms. Be sure the dry pipe valve and riser on the water supply side of the valve are adequately protected against freezing. Heat the valve enclosure using electrical heater strips under thermostatic controls so that a minimum of 50°F can be maintained. Ascertain that sufficient air is in the system to allow for drops in pressure that occur with low temperatures. The pressure should be checked daily during cold weather (preferably at night), or provide supervision of the pressure and low-pressure alarms. Air is usually supplied to a dry pipe system by a compressor. The air intakes into the compressor should be located in a cold, dry location. 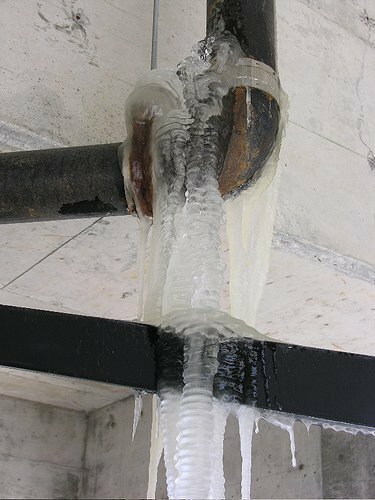 Avoid warm, damp areas, because moisture introduced with the air condenses in the piping and collects at low points where it may freeze. Repair, replace, or refasten broken, missing, or loose sprinkler pipe hangers to ensure the proper pitch of sprinkler piping and to provide good drainage. Repair all air leaks in the system to prevent the valve from tripping should the compressor lose power. A temperature-signaling device monitored by a central-station alarm service can be installed in the valve enclosure. Taking these basic precautions will go a long way to ensure that your employees and customers will be safe and sound during the chilly months ahead. Give us a call if you have any questions about this important topic. You’ll thank yourself later. Happy holidays!